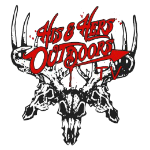 His & Hers Outdoors follows four different families and their friends who through their shared passions have become one big family enjoying the outdoors. You will witness all of our ups and downs, practical jokes, blood, sweat and tears that we put into our everyday lives. Trying to manage our individual jobs, raising our families and having some fun doing what we love most isn’t always easy, but it’s definitely worth it. We travel all over hunting, fishing, shooting 3D tournaments, camping, mowing the lawn and anything else we can do outdoors! Our cameras are always rolling so you never know what you’re going to get to see! We want to share our love of the outdoors and our families with all of you! Jon and Stacy Decided to take their hobby and passion to the next level, and started His & Hers Outdoors. With this adventure, we would like to share their experience and knowledge with other hunting and outdoor enthusiasts. Whether it is fishing, hunting, or shooting 3D, we want to encourage new hunters, old hunters and youth to experience something new. We reside in central Oklahoma with my wife and my daughter, Maison, who is showing interest in the same hobbies we have. We are truly blessed because she gives us the best of both worlds she can be a total girly girl and then on the flip side she is a rough and tough tomboy.